White Rice & Diabetes | Dr. Sircus. PODIATRISTS, tenders of corns, bunions and other troubles of the humble foot, are classified as second-class citizens in the medical world – a rung below full-fledged M.D.s. But with the surge in people with diabetes, they’re playing a particularly vital role these days in preventing amputations. And there’s a move afoot to boost their official status as well, reports Jan Ferris of the Sacramento Bee. “We kind of see ourselves as the profession that keeps people walking,” said Dr. Jon Hultman, executive director of the California Podiatric Medical Association. Obesity is the primary culprit for the boom in cases of type 2, or adult-onset, diabetes. As the numbers rise, so does the need for early treatment – especially of foot sores or ulcers that can quickly threaten the lower limbs. Sixty percent of all non-traumatic amputations in the U.S. are due to diabetes, according to the American Diabetes Association. Indeed, podiatry (foot care) for people with diabetes is one of the most overlooked aspects of diabetes management. Reviewing the community discussion regarding podiatry and particularly for visiting podiatrists reveals that many people with diabetes are entirely unaware that they need to take special care of their feet and visit a podiatrist at once if problems arise. Higher levels of blood glucose can damage the nerve endings in many areas of the body and organs, which is why tight blood glucose control is an essential aspect of diabetes care. But here’s the thing: Though podiatrists can operate on the foot and ankle, give injections and provide other medical care, they aren’t licensed doctors of medicine, or M.D.s. As such, Hultman and others maintain, the state’s 1,800 doctors of podiatric medicine (DPMs) are hamstrung by law from treating many of the 7.5 million Californians insured through Medi-Cal (due to a 2009 state budget cut), partnering fully in the hospital care of diabetic patients and gaining access to first-rate residencies in their podiatric training. Indeed, on a given day with the Sutter Medical Group, 30-year podiatrist Dr. Spencer Lockson treats the foot from several angles: dermatological, as in athlete’s foot and eczema; bone and joint issues, such as bunions, fractures and “hammer toe” deformities; and nerve conditions, which are often associated with diabetes. “We avoid amputations the best we can,” he said. But this time around, the CMA is playing the opposite role. It’s teaming up with the California Podiatric Medical Association and the California Orthopaedic Association to consider putting the training of foot specialists on par with M.D. standards, according to CMA Chief Executive Officer Dustin Corcoran. The three groups are creating a task force to review the curriculum at California’s two podiatry schools and, depending on the outcome, appeal jointly to the national Liaison Committee on Medical Education to reclassify the licensing for podiatrists. Dr. Lawrence Harkless, a podiatrist and dean of the Pomona-based College of Podiatric Medicine at the Western University of Health Sciences, believes the move makes good sense. “I don’t have an M.D., but I practice medicine every day. If I’m that close, why not just be it?” he said. The first two years of podiatric training are similar to those for full-fledged physicians, with the emphasis on anatomy, physiology, pathology and other core subjects. Podiatry students jump into more specialized training the next two years, then generally spend the last two or three years as hospital residents. Training for licensed medical doctors generally takes several years longer, with the length for residencies determined by the specialty. With a physician shortage in California, and the aging baby boomers’ growing need for care, podiatry may become a more attractive option if granted M.D. status, he added. Sacramento podiatrist Kevin Kirby isn’t convinced. He chose podiatry school in the 1980s, in part because of its “efficient” focus on the foot and a postgraduate commitment of six years instead of eight or nine. If new requirements called for additional training, he wonders if students would just choose a different branch of medicine. “Overweight and obese people appear to really have options when choosing a weight-loss program, including a low-carb diet, and even if it means eating more fat,” says the studies’ lead investigator exercise physiologist Kerry Stewart, Ed.D. Stewart, a professor of medicine and director of clinical and research exercise physiology at the Johns Hopkins University School of Medicine and its Heart and Vascular Institute, says his team’s latest analysis is believed to be the first direct comparison of either kind of diet on the effects to vascular health, using the real-life context of 46 people trying to lose weight through diet and moderate exercise. The research was prompted by concerns from people who wanted to include one of the low-carb, high-fat diets, such as Atkins, South Beach and Zone, as part of their weight-loss program, but were wary of the diets’ higher fat content. In the first study, presented June 3 at the annual meeting of the American College of Sports Medicine in Denver, the Johns Hopkins team studied 23 men and women, weighing on average 218 pounds (about 99 kg) and participating in a six-month weight-loss program that consisted of moderate aerobic exercise and lifting weights, plus a diet made up of no more than 30 percent of calories from carbs, such as pastas, breads and sugary fruits. As much as 40 percent of their diet was made up of fats coming from meat, dairy products and nuts. This low-carb group showed no change after shedding 10 pounds (4.5 kg) in two key measures of vascular health: finger-tip tests of how fast the inner vessel lining in the arteries in the lower arm relaxes after blood flow has been constrained and restored in the upper arm (the so-called reactive hyperemia index of endothelial function), and the augmentation index, a pulse-wave analysis of arterial stiffness. Low-carb dieters showed no harmful vascular changes, but also on average dropped 10 pounds in 45 days, compared to an equal number of study participants randomly assigned to a low-fat diet. The low-fat group, whose diets consisted of no more than 30 percent from fat and 55 percent from carbs, took on average nearly a month longer, or 70 days, to lose the same amount of weight. “Our study should help allay the concerns that many people who need to lose weight have about choosing a low-carb diet instead of a low-fat one, and provide re-assurance that both types of diet are effective at weight loss and that a low-carb approach does not seem to pose any immediate risk to vascular health,” says Stewart. “More people should be considering a low-carb diet as a good option,” he adds. Because the study findings were obtained within three months, Stewart says the effects of eating low-carb, higher-fat diets versus low-fat, high-carb options over a longer period of time remain unknown. However, Stewart does contend that an over-emphasis on low-fat diets has likely contributed to the obesity epidemic in the United States by encouraging an over-consumption of foods high in carbohydrates. He says high-carb foods are, in general, less filling, and people tend to get carried away with how much low-fat food they can eat. More than half of all American adults are estimated to be overweight, with a body mass index, or BMI, of 26 or higher; a third are considered to be obese, with a BMI of 30 or higher. Stewart says the key to maintaining healthy blood vessels and vascular function seems ‒ in particular, when moderate exercise is included ‒ less about the type of diet and more about maintaining a healthy body weight without an excessive amount of body fat. Among the researchers’ other key study findings, presented separately at the conference, was that consuming an extremely high-fat McDonald’s breakfast meal, consisting of two English muffin sandwiches, one with egg and another with sausage, along with hash browns and a decaffeinated beverage, had no immediate or short-term impact on vascular health. Study participants’ blood vessels were actually less stiff when tested four hours after the meal, while endothelial or blood vessel lining function remained normal. Previous research had suggested that such a meal was harmful, but its negative findings could not be confirmed in the Johns Hopkins’ analysis. The same meal challenge will be repeated at the end of the study, when it is expected that its participants will still have lost considerable weight, despite having eaten more than the recommended amount of fat. “Even consuming a high-fat meal now and then does not seem to cause any immediate harm to the blood vessels,” says Stewart. However, he strongly cautions against eating too many such meals because of their high salt and caloric content. He says this single meal ‒ at over 900 calories and 50 grams of fat ‒ is at least half the maximum daily fat intake recommended by the American Heart Association and nearly half the recommended average daily intake of about 2,000 calories for most adults. All study participants were between the age of 30 and 65, and healthy, aside from being overweight or obese. Researchers say that in the first study, because people were monitored for the period they lost the same amount of weight, any observed vascular differences would be due to what they ate. Watch this video on Low-Carb, High-Fat Diet featuring Dr Mary Vernon. BLOOD sugar monitoring is a vital part of diabetes management. Patients and physicians rely on the hemoglobin A1c (HbA1c) test to measure an individual’s average blood sugar level over the prior three months. It is the most commonly used long-term blood sugar test, and the gold standard for the medical community. While the American Diabetes Association has deemed the HbA1c test an effective tool for diagnosing diabetes, kidney doctors recently determined that the HbA1c is not as useful for managing patients with diabetes and advanced kidney failure. Another test, the glycated albumin or GA assay, appears to be far more effective in this setting, they say. The GA test, developed by Tokyo-based Asahi Kasei Pharma Corporation, measures blood sugars over the past 17 days, as opposed to the longer time frame for HbA1c. In situations where rapid changes occur in blood sugar, the GA gives a more accurate picture of diabetes control. The GA test used in this study is available in Japan, China and South Korea, but is not yet FDA approved in the United States. According to a new study at Wake Forest Baptist Medical Center, which appears online in the Clinical Journal of the American Society of Nephrology and is scheduled for the July print issue, many organs don’t function properly in severe kidney failure. For example, most dialysis patients have anemia with fewer red blood cells than they should, which has a dramatic impact on the accuracy of the HbA1c reading. Hemoglobin inside red blood cells carries oxygen in the body. Blood sugar chemically interacts with the hemoglobin to identify a value for HbA1c. But HbA1c results are only accurate when red cells have a normal lifespan. Dialysis patients have shorter red cell survival, reducing the time that sugar in the bloodstream has to interact with hemoglobin, and causing lower HbA1c values. “Doctors long thought the HbA1c predicted outcomes in diabetes. This test is not predictive of outcomes in diabetes patients with kidney disease on dialysis. Dialysis patients and physicians get a false sense of security because their lower HbA1c actually relates to shorter red cell survival, yet suggests diabetes control is better than it really is,” explained Barry I. Freedman, M.D., John H. Felts III Professor and lead investigator. Freedman and colleagues evaluated 444 patients with diabetes undergoing dialysis. Patients continued their normal treatment and HbA1c monitoring, but also agreed to have a GA test every three months for an average of more than 2.3 years. Wake Forest Baptist researchers compared the patients’ HbA1c and GA test results, assessing their ability to predict hospitalizations and survival. They found that the HbA1c failed to predict these important medical outcomes. In contrast, the GA was a strong predictor of patient survival and hospitalizations. Nearly 500,000 people are on dialysis in the Unites States and diabetes is the cause of kidney failure in nearly 50 percent of them. 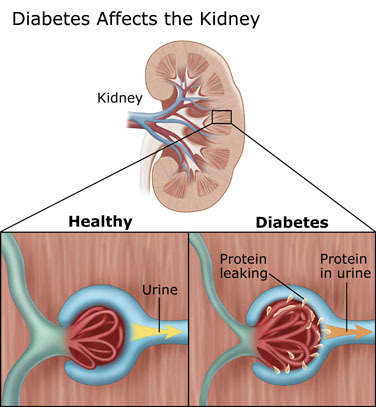 Diabetes is the most common cause of kidney failure worldwide and is associated with high mortality rates – more than 20 percent of dialysis patients die each year. As such, there is an urgent need for accurate blood sugar testing in diabetic dialysis patients. Freedman suggests physicians not rely on the HbA1c in dialysis patients, instead suggesting that blood glucose levels be directly monitored with multiple daily readings until the GA test is available in the states. The GA test is not limited only to dialysis patients. Some studies have shown that shorter-term markers for glucose control may lead to better management of glucose than longer-term measures with the HbA1c test. So, instead of waiting 3-6 months for an HbA1c test, which is the current recommendation, the rapid and inexpensive GA test could be performed monthly. Several studies have confirmed that measurements of GA and HbA1c are closely correlated. Though the GA test has been available in labs for years, Epinex Diagnostics, the developer of the rapid result GA measurement called G1A™, believes the mounting scientific evidence that supports GA testing will eventually gain wide acceptance among professionals. Numerous studies show the need for a mid-range test that could be performed monthly as another means of helping people with diabetes manage their glucose levels more effectively. A UK survey carried out by Cardiff University researchers last year about the effect of diabetes on their lives, almost 74% of patients reported that diabetes influenced their decisions regarding major life changing events. Among the respondents, 40% said that diabetes had influenced their decision to take early retirement and 22% said it had influenced a decision to change profession. Respondents also said that diabetes had influenced decisions to change lifestyle (22%) or have children (14%). Now a new study provides more evidence that people with diabetes may leave the workforce sooner than employees without diabetes – suggesting that the common disease could be taking a large economic toll, according to French researchers. The findings, reported in the journal Diabetes Care, echo those from a U.S. study that was reported in 2004. In that study, adults with diabetes were less likely to be working in their 50s than similar adults without the disease. And researchers estimated that between 1992 and 2000, diabetes accounted for $4.4 billion in lost income due to earlier retirement and nearly $32 billion due to work disability. For example, diabetes complications such as vision loss and nerve damage can lead to mobility problems or amputations that make it difficult or impossible for people to do their jobs. Diabetes is also often linked with medical conditions, like heart disease or kidney disease. Then there is obesity, one of the major risk factors for developing diabetes. Dray-Spira’s team found that obesity seemed to explain much of the higher risk of work disability among people with diabetes. These latest findings, Dray-Spira’s team writes, underscore the point that diabetes “has major social and economic consequences for patients, employers, and society.” The results are based on data from a long-term health study of employees at the French national gas and electric company. Between 1989 and 2007, 506 workers developed diabetes. Dray-Spira’s team compared each of those workers with five diabetes-free co-workers the same age and in the same job type. Overall, diabetics were less likely to still be working in their mid-50s. By age 55, 52 percent of workers with diabetes were still on the job, versus 66 percent of those without diabetes. The gap narrowed by the time the workers were 60 years old, the official retirement age in France during the study period. At age 60, 10 percent of diabetic workers were still on the job, compared with 13 percent of their co-workers. In addition, by age 60, roughly five of every 100 diabetics were on disability, compared to roughly one of every 100 non-diabetics. Dray-Spira noted that France has both a relatively young retirement age and a universal healthcare system. The impact of diabetes on retirement and disability could be greater, she said, in a country where people typically work longer and lack universal healthcare – like the U.S. “The major implication of our results is that particular attention should be paid to help people with diabetes in maintaining employment,” Dray-Spira said. Work life problems faced by diabetics extend even beyond retirement. Last year an Australian study published in The British Journal of Diabetes & Vascular Disease noted: “Compared with those who are in full-time employment with no health condition, those who have retired early due to diabetes have significantly lower odds of owning any wealth (odds ratio 0.03, 95% confidence interval 0.00–0.30). RESEARCHERS from the US and The Netherlands have found ways to earlier and better prediction of diseases such as diabetes, atherosclerosis, and heart disease through studying the genetic make-up of different varieties of lipids in blood plasma. Studying the genetic make-up of different varieties of lipids (fatty molecules) in the blood plasma of an individual can lead to a better and earlier prediction of diseases such as diabetes, atherosclerosis, and heart disease, two researchers reported on Monday at the annual conference of the European Society of Human Genetics, currently in session in Amsterdam, The Netherlands. In the first study, Dr. Joanne Curran from the Texas Biomedical Research Institute, San Antonio, USA, reported that lipidomic profiling would become a more reliable early indicator of individuals likely to develop diabetes than the more commonly used predictors such as blood glucose and insulin levels. Dr. Curran and colleagues from the US and Australia measured 356 different lipid varieties from about 1100 Mexican American members of large extended families who were part of the San Antonio Family Heart Study. The Mexican American population is at high risk of diabetes with about 25% of this population ultimately becoming diabetic. At the start of the research, 861 of the individuals studied did not have diabetes. However, over the 10 year follow-up examined in the study, 110 individuals did develop the disease. The scientists were able to isolate 128 different varieties of lipids that predicted the progression to diabetes by measuring the lipidomic profiles of each individual at multiple timepoints during the follow-up period. “The single best predictor we found was a novel component called dihydroceramide (dhCer). This was substantially increased in people with diabetes. It is also heritable, and appears to be an independent risk factor unconnected to blood sugar and insulin levels,” said Dr. Curran. After uncovering the link between dhCer and diabetes, the team searched the genome to find locations that harbored genes that influence dhCer levels. They identified a region on chromosome 3 that appeared to contain a gene with substantial importance for the production of dhCer. “Through whole genome sequencing, we are now attempting to identify this causal gene in the hope that it will be informative in the understanding of the pathogenesis of diabetes, and also suggest new avenues for treatment,” Dr. Curran said. In the future, the researchers say, measurement of dhCer levels could become routine in the prediction of individuals likely to become diabetic. One of the difficulties of the current predictive methods is that they do not function until a patient is near to developing the disease. Being able to identify those at risk at the earliest stage would mean that individuals have plenty of time to make the lifestyle changes that could help them avoid the disease – through a change in diet, or increasing physical activity, for example. “Currently one in ten US adults suffers from diabetes and recently the Centers for Disease Control has predicted that this will increase to one in three by 2050,” said Dr. Curran. “We are optimistic that our discovery will lead to new treatments, but in the short-term the importance of finding out at an early stage whether any individual is likely to develop it cannot be overstated. A test based on dhCer levels will help to avoid the serious health effects that diabetes has in its own right, such as kidney failure, amputations, and blindness. It is, of course, also a risk for cardiovascular disease, so the health burden of this condition is enormous”, she was quoted saying in a press release. In the second study, Dr. Sarah Willems, from the Erasmus Medical Centre, Rotterdam, The Netherlands, described to the conference research carried out on the influence of common genetic lipid variants on atherosclerosis and related heart disease. “A recent genome-wide meta-analysis of more than 100,000 individuals identified a large number of genetic variants associated with levels of LDL (bad) cholesterol, HDL (good) cholesterol and triglycerides. These molecules are, at increased levels of LDL and triglycerides and decreased levels of HDL, important risk factors for cardiovascular disease”, said Dr. Willems. “As our knowledge of genetic variation increases, preclinical genetic screening tools might enhance the prediction and prevention of clinical events,” Willems’ group told attendees. The researchers used risk scores from these genetic variants to test the hypothesis that their cumulative effects were associated with cardiovascular disease. For this purpose they used genetic data from more than 8000 individuals from the population-based Rotterdam Study and more than 2000 individuals participating in the Dutch family-based Erasmus Rucphen Family study. They found an association between the LDL risk score and arterial wall thickness, and a strong association of this risk score with carotid plaque. These conditions can cause arterial blockage which leads to stroke. The same risk score was also associated with coronary heart disease. New genetic variants influencing lipid levels are being identified all the time, the researchers say. “As new variants are discovered, we would like to be able to continue to test them, both singly and combined, for association with cardiovascular disease. The cost of these diseases to individuals, families, society and healthcare systems is immense”, said Dr. Willems. “Cardiovascular disease is the main cause of death in Europe, killing over 4 million people per year. It also represents 23% of the total disease burden (illness and death) across the continent. Managing cholesterol levels is important for prevention. This can be done early in life by effective treatment. We hope that our study, showing that common genetic variants play an important role in the occurrence of cardiovascular disease, marks a starting point for early prediction and prevention and may thus reduce the burden of disease,” she concluded. Traditional clinical risk factors can predict diabetes and heart disease already, but adding genetic tools to the mix could be useful, particularly in determining how aggressively to approach prevention in patients considered intermediate risk by conventional measures, commented Donna Arnett, PhD, MSPH, of the University of Alabama at Birmingham School of Public Health, and a spokesperson for the American Heart Association. The cost of genetic testing could be a hurdle for clinical application, though, until ways are found to make it more affordable, she noted in an interview, adding lipodemic profiling is still in its infancy and more information is needed on how measures like dihydroceramide might measure up against clinical factors like waist circumference. The European Society of Human Genetics aims to promote research in basic and applied human and medical genetics, to ensure high standards in clinical practice and to facilitate contacts between all persons who share these aims, particularly those working in Europe. It currently has about 1600 members from 66 countries. About 2500 delegates are attending this year’s conference. Note: These studies were published as an abstract and presented at a conference. These data and conclusions should be considered to be preliminary until published in a peer-reviewed journal. Is Anorexia A Sort Of Cousin Of Diabetes? ANOREXIA may be a disorder more of the metabolism than the mind, according to a new paper that argues the disease is a sort of cousin of diabetes. But this theory of anorexia as a fundamentally biological disorder, rather than a psychological one, is untested, psychiatrists warn, and patients with the disease should not stray from proven treatments. The review of past research on the topic, published in the June issue of the journal Molecular Psychiatry, finds that certain genetic and cellular processes get activated during starvation in organisms ranging from yeast to fruit flies to mice to humans. The idea, says study researcher Donard Dwyer, is that in people with a broken starvation response, a few initial rounds of dieting could trigger a metabolism gone haywire. In this theory, it’s not stubbornness or a mental disorder that keeps anorexics from eating, it’s their own bodies. The theory could explain why it can be so difficult to convince anorexic patients that anything is wrong with them, says Dwyer. “Unless we conceive of it as more of a metabolic function, I don’t think we’ll get past the first stage of treatment with a lot of the real hard-core patients,” he says. In the current understanding of anorexia nervosa, an eating disorder in which patients don’t maintain at least 85 percent of their normal body weight for their height, overachieving personality types attempt to control stress and emotion by restricting food and/or extreme exercising. Dwyer sees the disease, instead, as a condition similar to diabetes. Someone who becomes obese and is genetically susceptible will develop insulin resistance, which then becomes diabetes. An initial trigger — the obesity — is required, but once the patient has diabetes, you can’t talk him or her out of the disease. If Dwyer is right, difficult-to-treat anorexic patients may need drugs to get their metabolisms back on track, much as diabetic patients have to take insulin shots. But so far, the idea has not been tested in humans. Dwyer is careful to say that much more research is needed. But he says there is good reason to continue the work. Research on obesity has shown that being too heavy is more complex than simply calories in, calories out, he says. There are genetic and metabolic factors involved that make it hard for some people to shed weight. And obesity-related changes to the epigenome (our genes’ on-off switches) can even be passed down from mother to child. The same could be true on the flip side, with starvation, Dwyer says, adding, the genes linked to anorexia could be the same ones that regulate the metabolism during starvation. Additionally, studies on starving people suggest that many of the supposed causes of anorexia, including food obsession and anxiety, may be symptoms of starvation. And starving people, like anorexics, often report that they’re doing much better than their physical condition would suggest. SCIENTISTS from the University of Warwick in the UK have discovered a new form of ‘ultra-bad’ cholesterol that increases the risk of heart disease. The fatty material is stickier than the common form of ‘bad’ cholesterol, making it more likely to attach to artery walls. Funded by the British Heart Foundation (BHF), the researchers found that ‘ultra-bad’ cholesterol, called MGmin-low-density lipoprotein (LDL), which is more common in people with type 2 diabetes and the elderly, appears to be ‘stickier’ than normal LDL. This makes it more likely to attach to the walls of arteries. 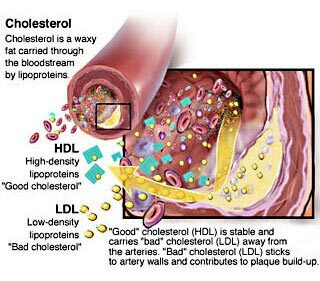 When LDL attaches to artery walls it helps form the dangerous ‘fatty’ plaques’ that cause coronary heart disease (CHD). The research – published online on May 26 in the journal Diabetes – shows how the make-up and the shape of a type of LDL cholesterol found in diabetics could make it more harmful than other types of LDL. The findings provide one possible explanation for the increased risk of coronary heart disease in people with diabetes. Understanding exactly how ‘ultra-bad’ LDL damages arteries is crucial, as this knowledge could help develop new anti-cholesterol treatments for patients. The researchers made the discovery by creating human MGmin-LDL in the laboratory, then studying its characteristics and interactions with other important molecules in the body. They found that MGmin-LDL is created by the addition of sugar groups to ‘normal’ LDL – a process called glycation – making LDL smaller and denser. By changing its shape, the sugar groups expose new regions on the surface of the LDL. These exposed regions are more likely to stick to artery walls, helping to build fatty plaques. As fatty plaques grow they narrow arteries – reducing blood flow – and they can eventually rupture, triggering a blood clot that causes a heart attack or stroke. The discovery might also explain why metformin, a widely prescribed type 2 diabetes drug, seems to lead to reduced heart disease risk. Metformin is known to lower blood sugar levels, and this new research shows it may reduce the risk of CHD by blocking the transformation of normal LDL to the more ‘sticky’ MGmin-LDL. Meanwhile, U.S. officials abruptly halted a major study Wednesday of a drug that boosts people’s good cholesterol did not go on to prevent heart attacks or strokes. The disappointing findings involve super-strength niacin (Niaspan), a type of B vitamin that many doctors already prescribe as potential heart protection. The failed study marks the latest setback in the quest to harness good cholesterol to fight the bad kind. The trial, called AIM-HIGH, looked at whether adding Niaspan — a high-dose, extended-release form of niacin, or vitamin B3 — to certain heart-disease patients’ statin drug regimens would prevent more cardiac events than a statin alone. “This sends us a bit back to the drawing board,” said Dr Susan Shurin, cardiovascular chief at the National Institutes of Health. The study tested Abbott Laboratories’ Niaspan, an extended-release form of niacin that is a far higher dose than is found in dietary supplements. As expected, the Niaspan users saw their beneficial HDL levels rise and their levels of risky triglycerides drop more than people who took a statin alone. But the combination treatment did not reduce heart attacks, strokes, or the need for artery-clearing procedures such as angioplasty, the NIH said. It led the NIH to stop the study 18 months ahead of schedule. A woman’s risk of developing diabetes during pregnancy can be identified up to seven years before she becomes pregnant based on routinely assessed measures of blood sugar and body weight, according to a Kaiser Permanente study published in the online issue of the American Journal of Obstetrics and Gynecology. A study in the American Journal of Obstetrics and Gynecology found there is an increased risk of recurring gestational diabetes in pregnant women who developed gestational diabetes during their first and second pregnancies. A study in Diabetes Care of 10,000 mother-child pairs showed that treating gestational diabetes during pregnancy can break the link between gestational diabetes and childhood obesity. That study showed, for the first time, that by treating women with gestational diabetes, the child’s risk of becoming obese years later is significantly reduced. A study in Obstetrics & Gynecology of 1,145 pregnant women found that women who gain excessive weight during pregnancy, especially in the first trimester, may increase their risk of developing diabetes later in their pregnancy. THE potential of wireless health will be realized in the effective blending of three bodies of learning: high technology; life sciences; and human factors. The last point is critical — end users (including consumers, patients and clinicians) will ultimately determine the successes and failures in wireless health. There is also a fourth factor in the creation of any convergence sector such as internet commerce, mobile data or digital music. The fourth factor is the ecosystem of innovators, executives, investors, clinicians (for healthcare) and policy makers who are creating the sector. The following discussion is intended to level set the discussion about why wireless health is important, to provoke conversation, and undoubtedly to set myself up for some predictive failures. What is wrong with healthcare and what does wireless health have to offer? Societies have no choice but to change their healthcare systems in the face of exploding demand caused by aging and chronic disease. The U.S. healthcare system is already failing millions of its citizens. Wireless health offers the opportunity to satisfy this demand, thus improving life and creating shareholder value. Nonetheless, it is apparent that some institutions and professions will resist the demand for more personalized and efficient access to care. In the face of competition and digital information, however, they will ultimately be unable to resist disruptive change any better than the automobile, music or retail industries. Wireless health is powerful because it creates transparency in healthcare through measurable outcomes, and transparency creates accountability. If a device or service can be connected, it should be (under penalty of malpractice, obsolescence and/or customer dissatisfaction). How else will you be able to answer questions about how your product works in the field or why someone should buy it? If you do not take this approach and your competitor does, how will you sell against connectivity? This is why we have Merlin, CareLink and Latitude even though St. Jude, Medtronic and Boston Scientific created these wireless services without extra reimbursement. In the developing world, increases in chronic disease and demand for access to health services rival or exceed our challenges in the developed world. U.S. life sciences companies should look for markets in the entire world and not just in the dwindling populations of rich and well insured in the U.S. and Europe. Five billion cell phone users constitute the largest distribution channel ever created in the world. How are you going to use it? Epocrates was founded on the principal that clinicians needed on-the-fly access to accurate and up to date information via mobile devices and it has grown to establish a platform serving a majority of U.S. practitioners with several important services. It has achieved business success and its investors and founders will be rewarded. Whether Epocrates will extend this platform to the rest of the world or leave that opportunity to others remains to be seen. is moving towards free. Access to medical knowledge, including personal genomics, is being distributed directly to consumers. So far, these trends have primarily influenced a motivated minority of consumers and especially the healthy wealthy, but over time they will shift power and responsibility to patients who will have to manage more healthcare decisions for themselves and their families. Digital music ultimately reshaped the music industry. Wireless health will have a similar impact in healthcare. In societies with limited access to healthcare and limited spending, wireless health delivers access to knowledge and care. In the U.S., it is disruptive and resisted. Why? Partially because the U.S. spends too much and gets too small a return compared with the rest of the world. There is resistance to change because it is economically, culturally and legally disruptive. Professional licensure is well intended but state licensure and corporate practice restrictions shield physicians from competition. The FDA operates on a laudable principle that safety and efficacy must be demonstrated, but this standard should be relaxed if the new device or service is offering a monitoring of dark space where current services leave patients unmonitored. The fee for service system has created an environment where innovation depends on reimbursement which, in conjunction with device regulation, tends to freeze the innovation and impede its improvement. Notwithstanding these sources of inertia, the immutable forces of population aging, rising rates of chronic disease, and the effects of global competition, mean that (1) individuals will have increasing personal responsibility for coordinating their own and their family’s care and (2) access to fully insured care will continue to decrease. These trends turn “patients” into “consumers” and “caregivers” who demand better products and services than the healthcare industry is accustomed to delivering. Nearly ubiquitous wireless connectivity to the world’s population. Cell phones are a mobile and personal permanent address. Data storage, analytics and search capabilities that are declining in cost faster than the declining cost of content creation. Secure cloud based access to information via the Internet. Embedded wireless technology which enables wearable devices. Inexpensive whole genome sequencing and rapidly advancing esoteric diagnostic services, with results reported in a digital format to enable data sharing and analysis. What will we do with these tools? What is the future of the healthcare industry in the United States, the world’s most expensive healthcare market? Will it follow the trajectory of the music industry, which was controlled by a small number of companies until digital music and the Internet made access to music free, enabled free global distribution for artists, and transformed how music lovers spend their money. Will it follow the course of the auto industry which tried to maintain a market for low tech low quality cars, lost its status to international companies and now has downsized, created competitive products and is regaining market share. Unfortunately, elements of the U.S. healthcare industry may have more in common with the financial industry, especially its lack of transparency, high cost and government support. In a sense, the U.S. has run the largest clinical effectiveness study in history with the Medicare program: approximately 50,000,000 patients have participated over 30 years. The U.S. is ranked last among 19 industrialized nations with respect to preventable deaths, despite outspending these nations as much as twofold (Commonwealth Fund, 2008). The purpose of Medicare is to operate an effective health insurance program for the aged – notwithstanding clear evidence of its failure relative to the world, elements of the professions, key institutions, and consumers (as voters) resist thoughtful efforts at Medicare’s improvement. Fortunately, this problem has the attention of policy makers, entrepreneurs and some globally significant companies. How fast will the U.S. change? How do businesses thrive and investors earn a return in the face of uncertainty? There is no guide book for this situation, but with healthcare being the largest component of the U.S. economy and with the development of middle class healthcare markets in Asia, it is certainly an area that is replete with opportunity.